SuperScript is an CAD Script Generator that allows ease of selection of multiple files, along with quick generation of script files to apply to those multiple drawings. Numerous script fragments are included which lets you quickly assemble your script files from pre-built chunks of script rather than typing it in from scratch. Even though we have created an immense amount of automation for CAD, there will always be a need for scripts. They are easy to create (even by the novice) and allow a significant amount of automation to be applied. Dozens of hours of repetitious work can be completed in minutes by a well crafted script. Weeks worth of this type work can be completed by running a script overnight. 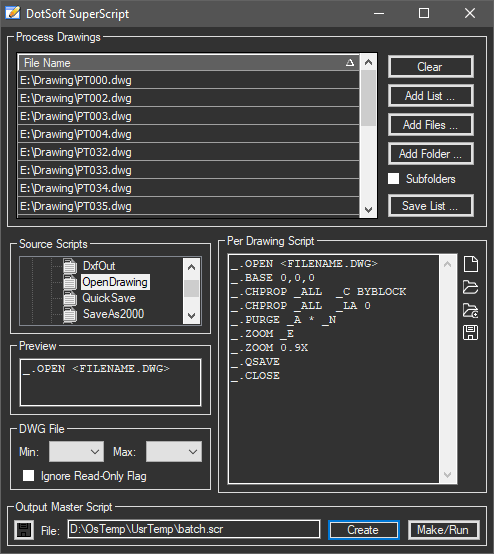 Simply drag your drawing files from Windows Explorer to our process list. Then drag/drop your script fragments from the structured tree into the editor, then click [Make/Run] to start the script. File Selection: The biggest obstacle in applying a script file to multiple drawings is finding and building a list of files. That's why our tool offers multiple ways to build a filelist. You can add a list (in a text file), select multiple files in a standard windows dialog, or simply choose a folder. If you tell it to include subfolders the application will automatically navigate the entire structure collecting all the files under the folder. So you could select every file in a drive by simply selecting the root folder. You can also save the list to a file for quick recall later. Per-Drawing Script: If your comfortable typing in scripts you can do right our build in editor. Even experienced users will like our quick building from the supplied script fragments. Simply drag operations you wish to apply in the list, and drop them into the master script. Process by Version: You can tell the application to only process drawing files less than (or greater than) a certain file version, great for updating old drawings. Options: You can ignore the operating systems read-only flag on files. Create or Make/Run: AutoCAD LT users can create the script file, then switch to their CAD application, execute the script command and paste in the script file name (which we automatically put in the clipboard). Full AutoCAD (2000 & higher) or BricsCAD users can simply choose Make/Run and the application automatically comes to the front and begins. Quickly select hundreds of files to process. Quickly assemble your script from supplied fragments. With a single button compile your multiple drawing script. Requires: Microsoft Windows XP or higher. Product Eval: Available on Request. Covers all computers at a site (address). Covers all computers in a corporation (multiple sites).